Dordrecht, March 31 2016 – FinCo closed a transaction with ENVIEM for the acquisition of the Gulf wholesale activities in the Netherlands consisting of direct sales, commercial fuels, bunkering and lubricants. The Gulf terminals, barges, trucks and associated employees are part of the transaction. 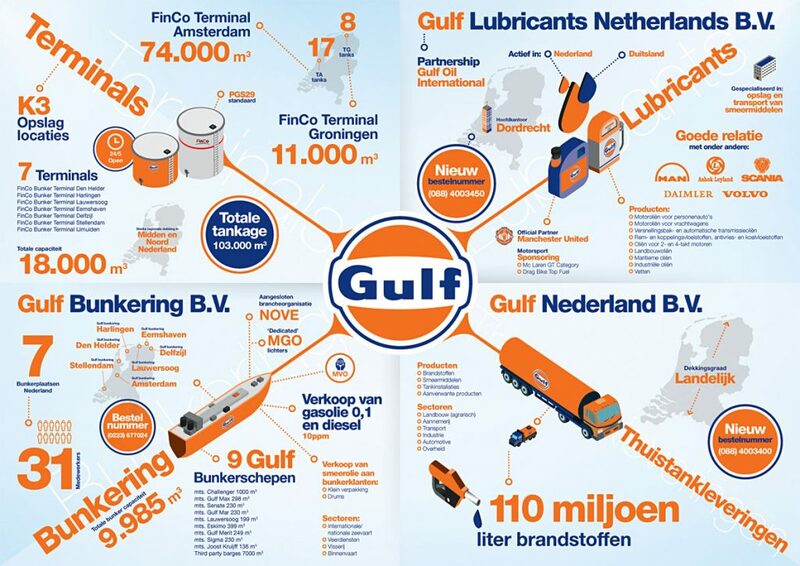 FinCo in cooperation with Gulf Oil International will enter into a new partnership for the marketing and distribution of lubricants in the Netherlands and Germany. FinCo and Gulf Oil International will continue marketing the famous Gulf brand with a new marketing campaign. With this acquisition FinCo will further strengthen its position in the Dutch downstream oil market and will be able to offer an extensive portfolio of services to its customers. Above mentioned activities are transferred to FinCo as per the 30th of March.